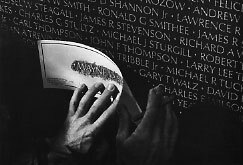 When people come to the Vietnam Veterans Memorial they look for names, and in the reflection of the granite they see themselves. They remember, grieve, say good-bye, and sometimes heal. I have photographed many of these people at a critical point in their lives. In my two years of photographing the memorial I've seen thousands of faces and heard hundreds of stories and all have been deeply moving. Not too long ago I was at the memorial. It was early morning. The sky was dull gray; the light soft and dim. The rain the night before had left the air heavy with moisture. As I had done so many times over the years, I began to walk up and down the memorial and look at the different things that had been left there the day before. There was a bottle of beer with a note attached, a POW bracelet, assorted flowers, American flags, a Purple Heart, two Bronze Stars, and a love letter from a sweetheart to her deceased fiancé. As I continued along the east wall, I came upon a pole stuck in the ground. it was about four feet high, and at the bottom was a small sign that read: ONLY ONE SON. Above the sign was a picture of a handsome young man in uniform, and around the photograph were small delicate flowers placed lovingly in perfect order. Above the picture was a medal from Vietnam and the young man's name. Above that was a medal of Jesus. Finally, at the top of the pole were Greek and American flags. I began to photograph this tribute, and as I was working someone tapped me on the shoulder. Without looking up, I said, "Yes?" A man with a heavy accent asked, "Do you like this?" Again without looking up, I said, "How could anyone not like this? It was done with a lot of love." "This is my son," the man said. I stood and saw a gray-haired man in a dark suit in his late sixties or seventies, his eyes filled with tears. I reached for his hand and said, "I'm sorry. I'm so very sorry." The man began to tell me about his son and why he had felt it his duty to serve in Vietnam. He reached into his coat pocket and pulled out a stack of photographs of his son's grave in Wisconsin. Next to the grave in most of the photographs was the mother of the boy. She wore black. The man told me that she had worn black for the last ten years. The day went on and I continued to work; the man was there all day. He would talk to people who looked like veterans, and he'd ask if they had known his son. After thirteen hours I left. The man was still there. Later that night I remembered my first visit to the memorial. I had gone to pay my respects to a boy I had known in high school, and I had been completely unprepared for my reaction when I saw his name. I remembered how that experience had led me to want to photograph the tragedy of war and its legacy. I wanted to do much more than just photograph the people and situations around the memorial. I wanted to understand them as well. After thinking further, I realized that for a long time my work had perhaps veered away from this direction. Instead of focusing on historical context, it had come to focus on individual lives. There were no answers in my photographs, no deep intellectual analyses that gave new insights or profound conclusions, no eloquent tributes. just images of people left behind to deal with the past. The legacy of war that has so often been invisible does have to do with the people left behind, their lives, and how they move on. From this vantage point, as these photographs show, it is the living who haunt us as much as the dead.